What are the heating curves for a parked car, on a warm & sunny day? It is expected that the completely closed car will heat up faster than an open car, which in turn should heat faster than a car parked in shade. However, it is unknown how hot the maximums will be. Qualitatively, it is known that entering a closed parked car can be quite unpleasant, especially since the Primary Testing Facility’s chariot has black leather seats. a temperature probe, ideally with transmitter and base station (we used a RediCheck Remote Cooking Thermometer ). starting from a parked car that hasn’t been used; take the car for a drive with the AC on or the windows open, to cool off the car interior. Re-park the car. record the internal temperature of the car every 1-5 minutes, until the air temperature reaches what you like your steaks cooked to (assuming the fair reader is a red-meat-a-vore), or the temperature levels off (whichever occurs first). repeat steps 1-6 with a car that has windows + sunroof open. All four windows were opened to create a 4-6 inch gap. repeat steps 1-6 with a closed car parked in the shade. The Primary Testing Facility’s chariot has a dark burgundy (“wine”) paint, and an internal volume of 91.4 cubic ft. The interior is black leather (not our first choice, it was purchased used…). 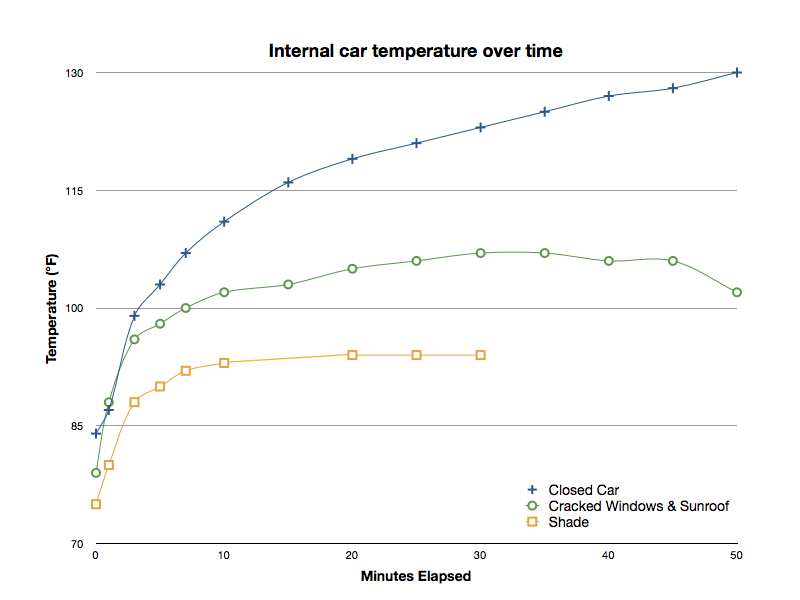 Heating curves for the air inside a parked car under different conditions. The initial environmental air temperature in all tests was 84°F. For the car parked in the shade, the immediate surrounding temperature was measured at 79°F, but atmospheric temperature where the sunny trials were held was still 84°F . The temperature difference between the shaded under-parking structure vs. our standard parking area, could be due to proximity to a water body. The shaded region utilized for this experiment was closer to a waterway than our normal parking plot. The dip seen at the end of the open-window trial was caused by a transient cloud. Otherwise, the trial periods were relatively consistently sunny. After almost an hour, the closed car still had not leveled off in temperature! There is also a huge difference between a closed car parked in the shade and an open car parked in the sun. Parking in the shade prevented the car’s interior from breaching the 100°F mark, even though none of the windows were open. A closed car, parked in the sun, rises in temperature very quickly. Most people who own cars would find that qualitative statement obvious, however, the fact that temperatures breach 100°F in a closed car in under 5 minutes is pretty impressive. Here at the primary testing facility, we cook our steaks to 125°F. The closed car hit that at 35 minutes. While the open window car did not get above 110°F, it did hit 100°F in 7 minutes; not too much different than the completely closed car. Given that heat stroke occurs in Humans when body temperature is driven over 104°F, and dogs when their body temps hit 109°F, environmental conditions in parked cars do get dangerously hot very quickly. An article about dogs claims that “On an 85-degree day it takes only 10 minutes for the interior of your parked car to climb to 102 degrees. In a half hour, it can reach 120 degrees.” In our trials, the parked & closed car had reached 111°F in 10 minutes, and was over 120°F in 30 minutes. While the quoted 102°F was spot on for our open car trial at 10 minutes, with the windows open, the car did not get above 107°F during the recording period. However, considering that dogs do not sweat, and generally rely on the environment being cooler than their internal temperature to cool off via panting, 107°F would still be dangerous for an animal who’s normal body temp is generally under 102°F. How does car color or internal car volume affect the heating curves? How does dappled shade (i.e. under a tree) compare to complete shade? ….can you can you cook a steak via the sous vide method in a closed car on a sunny day?